Happy Wednesday Happy Foodie Friends! Looking for a great donut / doughnut when your travelling the US? Here is what’s trending across America according to Eater.com, thank you as always Eater.com for the trending and hot / heater maps in many foodie categories. Again my only regret is that this does not include great Canadian donut / doughnut shops and I know we would rank high on these lists….. 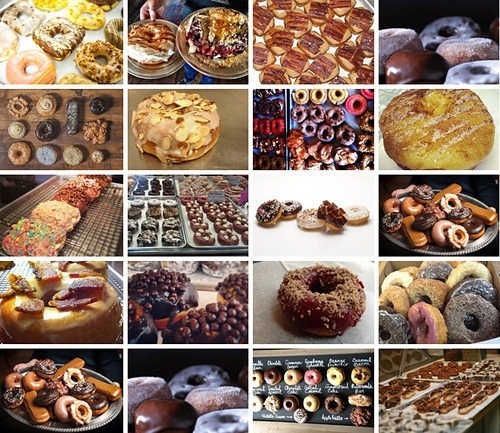 Here are 23 of the most buzzed-about specialty doughnut shops across the United States. What follows is a list of spots that have, for the most part, opened over the last twelve months. These include Umami founder Adam Fleischman’s doughnut concept inside a concept (& a Donut in Umamicatessen), two brand new fried-chicken-and-doughnut restaurants in Washington, DC (GBD and Astro Doughnuts) and a second location for Philadelphia’s iconic chicken-and-doughnut restaurant (Federal Donuts). There’s also a scratch-doughnut shop from Portland’s Micah Camden (Blue Star Donuts) and plenty of wild flavors and toppings to go around. Many thanks to the Eater city editors for their nominations. And please remember, these are ordered geographically and not by any other ranking. 1.THE HOLY DONUT Portland has a few solid doughnut options, but The Holy Donut is the newcomer that has gotten a lot of buzz. Even Maine Rep. Chellie Pingree let Tom Colicchio try a doughnut when he was lobbying in DC. These are Maine potato doughnuts and flavors include things like bacon and cheddar stuffed doughnuts, tart cherry and more. 2.UNION SQUARE DONUTS Somerville’s Union Square Donuts is only a few months old and already it has expanded into larger digs to bring even more doughnuts to the people of Boston. The new space reopened on May 3 with delights such as the bourbon salted caramel, maple bacon, chocolate chipotle, orange ginger cream and more. 3.THE GENERAL New York’s EMM Group opened their new Asian restaurant The General earlier this year and, months later, added on a bakery to the front cafe space. The bakery menu includes coffee and “pretzel bombs,” but mostly focuses on cereal-inspired doughnuts such as cinnamon toast, coco puffs and fruity pebbles. 4.FEDERAL DONUTS Mike Solomonov’s Federal Donuts has been inspiring doughnut shops across America for years and just this past fall opened up a second location for its magical combination of fried chicken and doughnuts. (There’s also a new stall at the Phillies ballpark.) Doughnut options include strawberry-lavender, Turkish coffee, milk chocolate-peanut butter, and blueberry muffin. 5.GBD (GOLDEN BROWN DELICIOUS) Short for Golden Brown Delicious, GBD is the new fried-chicken-and-doughnut shop from DC’s popular Neighborhood Restaurant Group. Pastry chef Tiffany MacIsaac is responsible for these doughnuts, which include a grapefruit campari old-fashioned, key lime curd filled brioche a coffee cake doughnut and more. There’s also plenty of fried chicken and booze on hand here. 6.ASTRO DOUGHNUTS & FRIED CHICKEN DC has had a bit of a doughnut boom in recent months and Astro Doughnuts is yet another fried-chicken-and-doughnut-centric shop to open so far in 2013. Pastry chef Jason Gehring is behind the doughnuts on this one, options of which include peanut butter and jelly, creme brulee, pina colada, coconut fudge and more. 7.MONUTS DONUTS After finding “a devoted following” at local farmers’ markets, the News Observer reports that Monuts Donuts got a brick-and-mortar location this year. Among the yeast and cake varieties on the menu here are toasted amaretto, blackberry julep, apple cider and cocoa-cinnamon doughnuts. 8.REVOLUTION DOUGHNUTS & COFFEE Revolution Doughnuts opened in spring of 2012 with the help of a Kickstarter project and instantly became Atlanta’s hotspot for a doughnut-and-coffee fix. Revolution offers all kinds of doughnuts, including filled rounds, yeast style, baked cake and cake style with toppings such as salted caramel and buttermilk bar and fillings such as banana cream pie or Nutella cream. They’ve also got vegan and gluten-free offerings. 9.GLAZED GOURMET DOUGHNUTS Though Glazed Gourmet has been open for about a year and a half now, Charleston’s hot doughnut shop started testing late-night hours on Fridays earlier this year. And, per Eater Charleston’s Katie Abbondanza, it’s been going well: doughnuts sell out at Glazed Gourmet no matter the hour. Rotating flavors include raspberry Nutella, lemon old fashioned, Irish car bomb and The Purple Goat, which is a berry goat cheese filled doughnut with a lavender glaze. 10.MOJO DONUTS South Florida — reportedly a little behind in the doughnut craze — got another independent doughnut shop in Mojo Donuts when it opened this past February. Flavors here include Guava n’ Cheese, Red Velvet Heaven, Log Cabin Bacon Bars and all sorts of other varieties of glazes and fillings. 11. FIRECAKES Doughnuts have been a thing in Chicago for some time now and Firecakes is the latest gourmet shop to hit the scene earlier this year from restaurateur Jonathan Fox. Firecakes’ signature doughnut is the yeast Tahitian vanilla glazed, but other options include the lemon verbena meringue, butterscotch praline and more. 12. GLAM DOLL DONUTS Glam Doll Donuts opened earlier this year, “bringing whimsical donuts back” to Minneapolis, according to Eater Minneapolis. And these are whimsical creations indeed, with flavors including a cake donut with peanut butter and sriracha, a fritter with cheese curd and bacon and multiple bacon-topped options. 13.HYPNOTIC DONUTS A little more than a year old, Hypnotic Donuts is still garnering lots of buzz from Dallas locals, including vegans now that it has begun offering a special vegan menu on Mondays and Tuesdays. Flavors include Evil Elvis and Turtle doughnuts, plus the Sopapilla Loren, which is a glazed doughnut with honey drizzle and topped with cinnamon sugar. 14. GOURDOUGH’S PUBLIC HOUSE One of Austin’s many food trucks to go brick-and-mortar, Gourdough’s Public House is a restaurant and bar whose tagline is all about the “Big. Fat. Donuts.” So while, sure, there are salads and barbecue on the menu, you can also get doughnut sandwiches, doughnut burgers, entrees such as chicken fried steak served atop a doughnut and, naturally dessert doughnuts of all kinds from the Squealing Pig to Salty Balls. 15. DIZZY’S DONUTS When Dizzy’s Donuts opened this past fall, it provided Boulder once more with its much-needed specialty doughnut fix. The early word was full of raves for these doughnuts which include peanut butter and chocolate, strawberry cheddar, creme brulee and maple glazed bacon among their options. 16. AMERICA DONUT SHOP The America Restaurant at New York-New York recently added a brand new doughnut shop to its entrance because that’s an excellent way to be greeted in America. This shop offers a whole host of the classic doughnuts, plus options like a bananas Foster-filled doughnut with chocolate icing and topped with nuts or a Candy Cake doughnut with sprinkles and chopped Reese’s Peanut Butter Cups on top. 17. THE PINK BOX DOUGHNUTS People have been losing their minds for Pink Box Doughnuts since they opened in December with a menu full of classics and gourmet doughnuts. The latter include Campfire S’mores, German chocolate cake, devil’s food with toffee topping, and a Fat Elvis with chocolate ganache and banana peanut butter filling. 18. DONUT BAR Donut Bar took San Diego’s Financial District by storm back in March with its $1 doughnut deals and variety of flavors. According to Eater San Diego, there are six standard varieties plus one special creation available at all times, including the likes of a blueberry old-fashioned doughnut with Meyer lemon glaze, a brown butter glazed yeast doughnut, and a bourbon maple glazed doughnut with sea salt. 19. SIDECAR DOUGHNUTS & COFFEE Lines have reportedly been out the door for Costa Mesa’s new specialty doughnut shop Sidecar, which opened in April after functioning as a pop-up last year. Rotating favors include huckleberry, strawberry basil, and banana Nutella. On Fridays, they add some gluten-free doughnuts into the mix. 20. UMAMICATESSEN Yes, LA’s insane new five-restaurants-in-one concept from Umami founder Adam Fleishman includes a doughnut shop amid its deli and bar offerings. Doughnuts at & a Donut are fried to order and include yeast and cake doughnuts topped with yogurt glaze, tres leches, ceylon cinnamon and german chocolate, plus beignets. 21. DOUGHNUT DOLLY Doughnut Dolly opened last summer in Oakland and quickly won the hearts of the Bay Area doughnut faithful. The signature flavor here is the “Naughty Cream,” with creme fraiche vanilla bean cream, plus there’s always a seasonal jam. Rotating flavors include Mexican chocolate, malted coffee cream, bourbon cream and more. 22. BLUE STAR DONUTS Little Big Burger’s Micah Camden and Katie Poppe opened their own scratch-doughnut spot back in December with all sorts of lavish doughnut options. There’s the brioche doughnut topped with chocolate ganache and devil’s food cake crumbles, old-fashioned buttermilk bars, Valrhona chocolate crunch doughnuts and so much more. 23. TOP POT DOUGHNUTS Though Top Pot has been a Seattle institution for some time now, the doughnut chain is on a major expansion kick and recently opened its first drive-thru location in Issaquah, WA. Top Pot offers all kinds of flavors of all kinds of doughnuts, from old-fashioned to feather boas, plus cake doughnuts in seasonal flavors. Tried any of the places on the list or feel there are any glaring omissions? You know what to do.